Border Patrol’s body-worn cameras will require good transparency policies. The agency’s historical lack of transparency suggests that without good policies, the cameras will become another tool for surveillance. 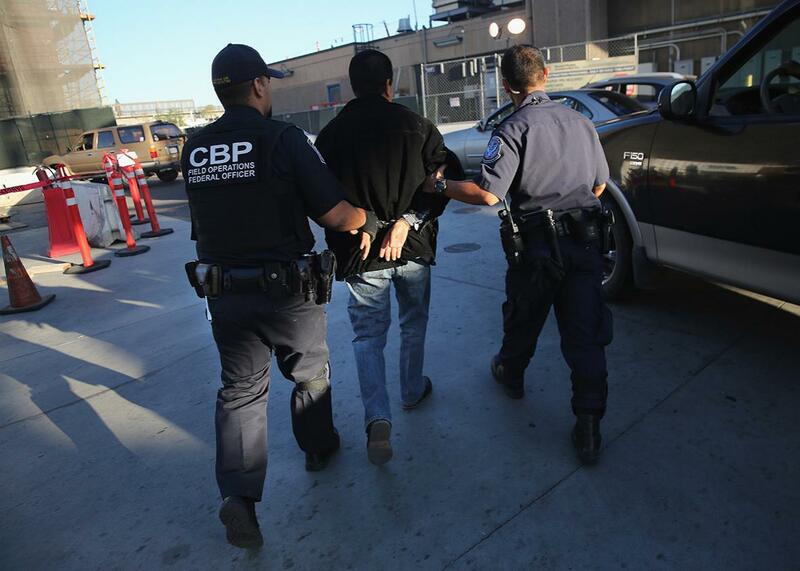 U.S. Customs and Border Protection officers detain a driver after a drug dog detected suspected narcotics in his vehicle coming from Mexico on Nov. 14, 2013, in San Diego. In November, U.S. Customs and Border Protection Commissioner Richard Gil Kerlikowske announced that the agency would expand its body-worn camera deployment in the coming months, using the cameras in “law enforcement operations such as checkpoints, vessel boarding and interdictions, training environments, and outbound operations at ports of entry.” This is a modest expansion to the border control agency’s ongoing pilot program, and it comes in spite of an internal evaluation by the agency’s Body-Worn Camera Working Group recommending caution because, among other reasons, the cameras might distract officers, lower officer morale, and fail to work in the harsh climate that border agents work in along the U.S.-Mexico border. Adopting body-worn cameras as part of a larger project to make the agency more transparent and accountable is potentially a step in the right direction. But without the implementation of proper policies for camera use and public disclosure of footage, it won’t do much to overcome the agency’s historical lack of transparency and its general resistance to releasing video footage to the public. Unless CBP commits to greater transparency and external oversight as part of its body-worn camera program, the cameras may become just another tool of government surveillance wielded by the state without adequate oversight. At the same time, CBP has also frequently withheld video evidence of agent-involved shootings, even in high-profile cases like the 2012 shooting of José Antonio Elena Rodriguez. In August 2015, a federal judge also sanctioned the agency for destroying video evidence that it was required to preserve during an ongoing civil rights lawsuit. Agent Lonnie Ray Swartz, the officer involved in the case of José Antonio, has recently become the first agent ever charged with murder for shooting a Mexican national through the border fence. However, CBP and the U.S. Justice Department have continually refused to release existing video of the incident to the public. Swartz repeatedly fired his weapon through the fence, hitting 16-year-old José Antonio 10 times, including eight times in the back (and possibly reloading in the process) as the youth was walking away from the officer, supposedly on his way home from a basketball game. Swartz claims it was self-defense. Of course, these sorts of problems are not unique to CBP or the Border Patrol. A number of local police agencies around the country have also resisted public disclosure of video footage depicting officer-involved shootings or other uses of force. Sometimes agencies relent only after judges order them to release footage—often quite some time after an incident took place. These incidents have inspired a public demand for body cams on police officers—but whether a city cop or a border agent, much of the potential social benefit of outfitting law enforcement with body-worn cameras hinges on agency transparency and the public availability of footage. Body cameras are joining a very sophisticated surveillance apparatus deployed by CBP along the nation’s southwest border with Mexico over the past couple of decades, including ground sensors, fixed camera towers, mobile camera units, drones, helicopters, and rescue beacons for migrants in distress. Undoubtedly, as the agency claims itself in its November 2015 statement about its continuing body-worn camera evaluation, video cameras have “long been a key component” in border security operations. However, it is not clear that these cameras have also played an important role in CBP’s “efforts to earn and keep the public’s trust and confidence,” as the CBP commissioner also claimed in that same report. In recent exploratory research with migrants, humanitarian volunteers, and Border Patrol agents in and around Nogales, Arizona, (and Sonora, Mexico), colleagues and I found that increasing levels of border surveillance provide only a small deterrent to potential migrants from making undocumented border crossings. The migrants we interviewed were generally supportive of the use of body-worn cameras by Border Patrol agents. But they were also concerned about officer discretion regarding when to record and allowing public access to footage, even when it might implicate border agents in wrongdoing. Some migrants claimed that body cameras would make Border Patrol agents treat them more humanely while others said they feared that officers would simply turn off their cameras when they wanted to treat migrants badly or that the agency would refuse to release video that might support a migrant’s claim of poor treatment. Research has repeatedly shown that body-worn cameras have the potential to increase officer accountability, provide better evidence of events, and modify the behavior of officers and civilians, but accountability is unlikely when police control the footage and refuse to release it publicly. Although CBP leadership has expressed a desire to improve transparency and improve internal review of misconduct by its officers, incorporating body cameras into that internal review process only signals the possibility of internal accountability. However, this development, without a firm commitment to more external transparency, neglects any consideration of external oversight and public accountability—a problem facing many local law enforcement agencies around the country as they adopt body-worn cameras and craft policies in the face of public pressure to become more transparent and accountable to their communities. The good news is that CBP can learn much from the adoption of body-worn cameras in police departments. The members of the CBP working group—not unlike many police officers—expressed concerns about the technologies. But at least in two departments in Washington state, evidence suggests that as officers are becoming increasingly positive about the cameras as they use them themselves or see colleagues use them without many negative repercussions. The Seattle Police Department has perhaps taken the most unique and, arguably, transparent approach to date, proactively posting its officers’ body-worn camera footage to a department-run YouTube channel after blurring—or otherwise obscuring—the entire frame of footage and removing all or most of the audio. That approach is wise, because body camera footage may include very sensitive personal information about civilians contacted by officers, including footage filmed inside homes, with victims of sexual violence or domestic abuse, or depicting minor children. Border Patrol agents who use these cameras will often record through the windows of innocent people’s cars, capture conversations about potentially sensitive or embarrassing subjects, or capture migrants suffering from various types of physical, emotional, and mental distress. We need to find a balance between full public disclosure and the privacy interests of citizens, migrants, and even innocent officers, or else we risk making personal privacy the collateral damage of our transparency efforts. However, unless CBP commits—and follows through on a promise—to provide external access to recordings made by its agents’ wearable cameras, and to require agents to record all encounters with migrants (or with others, for example, at checkpoints), the social value of any body-worn camera program will likely be insignificant, fulfilling a broader state surveillance purpose rather than providing any added transparency or accountability. If the agency will not commit to transparency, there may be no upside to financing the purchase of cameras or requiring officers to wear them in the first place.